KL Insight's Web Design VPS with Linode has been rock a solid solution over the last 4 years. It currently hosts multiple client sites and mail agent and all these sites and emails quickly eat up precious hard drive space; and with only 20GB the wall can be hit early. Linux logs everything, these logs grow overtime, systems run 'logrotate' to archive and delete old logs - the settings are very liberal and tweaking them could save gigabytes of space, 1.1GB in my instance. Modify your /etc/logrotate.conf as needed but the important bit is compressing by default and using bzip2 instead of gzip to do so. # Archive log files by adding a YYYYMMDD instead of simply adding a number. Be legendary and do social like this post as that helps me immensely. The python package setup procedure appears to be a mess, you have setuptools, distutils, distutils2 on the way and something new in Python3. All I set out to do was to fix the installation setup.py in django-simplemenu package which was omitting the not python plain locale directory but instead got myself involved a 3 hour roller coaster. The problem is that does not work, files specified in MAIFEST.in weren't being copied during install. After searching and trial an error the solution was to use distutils instead of the setuptools package. So if you are having issues import distuitls rather then setuptools. Web site service might be interrupted for short duration today while we update our web server framework stack to prevent a potential security issues. We apologize for any inconvenience this might cause and will update on progress as needed. 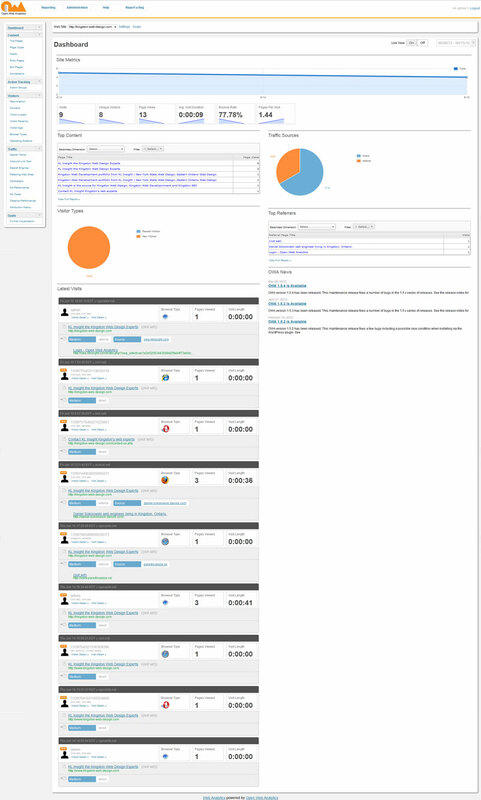 Last time I compared the Dashboard of Open Web Analytics and Google Analytics. 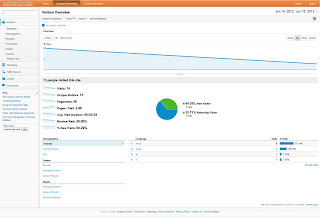 This time I am going to dig into the Dashboard a little more and show some details that I feel make OWA a superior product out of the box to Google Analytics. 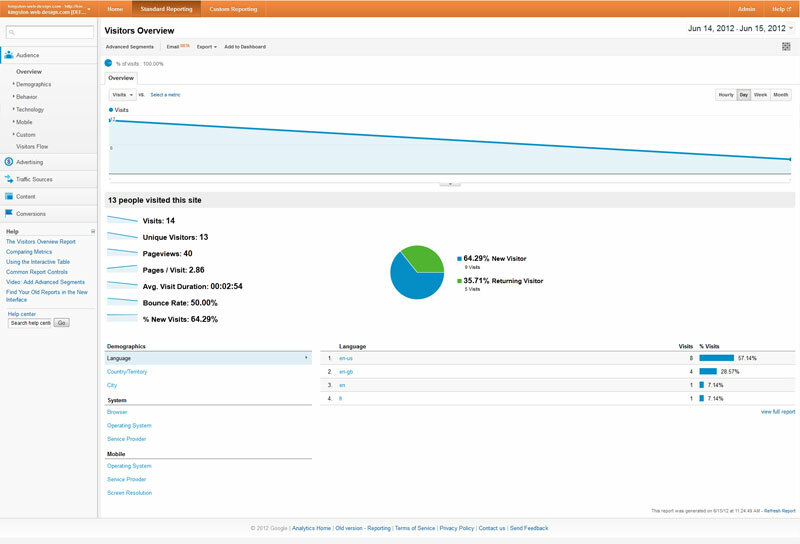 Right off the top Open Web Analytics shows traffic graph and visit overview that Google Analytics does. This data is important and certainly will be found in all analytics packages. The first main difference on the OWA dashboard is the Top Content section (pictured below). 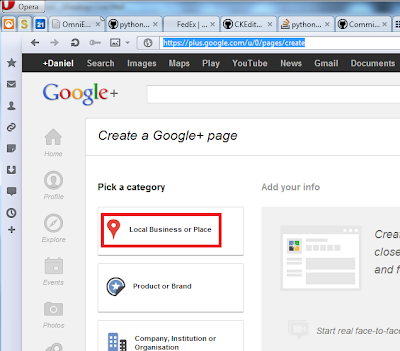 This allows you to see what pages are the most 'popular' pages on your site. As you can see our index page is the page with the most traffic. You will notice the options at the top for 'Secondary Dimension' and 'Filter'. Filter does exactly what it says it is. Filter allows you to set-up a filter or filters that will allow you to drill down on a specific Secondary Dimension with options like Exactly Matching, Not Matching, Greater than, Less than and Contains. What are Secondary Dimensions? Well it can be date related such as a specific day, week, month, year, etc Site, Visitor, Visit, System, Netowrk, Campaign, Visit Special, Geo, Content and Custom Vairables. In the image below you can see that I've selected the Operating System of our visitors which is under the 'System Secondary Dimension'. There is a problem with the options however. It seems that if you select a Dimension that has no data the widget breaks and the page needs to be reloaded. Like the Top Content getting information on the Top Referrers is just as easy. There is another widget called Top Referrers and it's default view lists the page sending traffic and the number of visits. You can of course filter and apply a Secondary Dimension to the widget to get even more specific data. If you click on one of the referrer pages you will be given even more data on the traffic which includes, a graph of the visits and the date for those visits, The total number of visits, The Avg. Time on site, Unique Visitors, Pages viewed per visit and the bounce rate. The last widget of note on this page is the Latest Visits widget. This handy digit give you all kinds of great data on your visitors and lets you drill down for even more data. In the widget you will find the date of the visit and their ISP, a geo location for the visitor, the browser they are using, how any pages they viewed, their visit length, the page they visited and how they found your site. 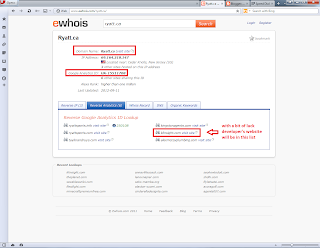 So far we have seen, Direct, organic-search which also includes the Source (Search Engine) and Search Term and finally referral which includes the Source (the referring domain) and a link to the referring page using the page title and listing the actual URL under the link, similar to what the Search Engines Do. You may notice quickly that some visitors have a 'new' banner over the avatar. I was excited to see this as it means each visitor is remembered and their visits to your site can be tracked. To view the data on the visitor there are two (2) links provided, Visit Detail and Visitor Detail. 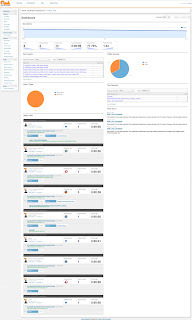 The Visit Detail link takes you to a page which displays the same Visit overview that is in the Latest Visits widget for the visitor you are looking at. The page also lists in reverse chronological order the pages on your site the visitor viewed and at what time they viewed the page. 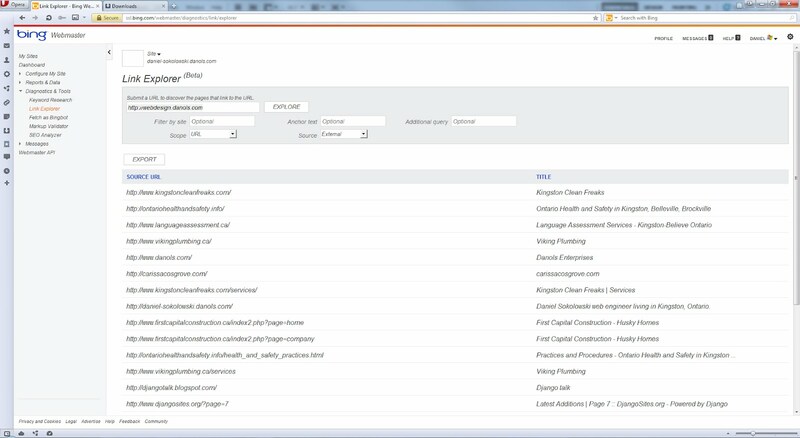 The Click Stream as it is called allows you to quickly see the path taken and how long each page was viewed for. The second option provided Visitor Detail gives you a complete Visitor History which includes the date of the First Visit to your and the total number of visits. This data is followed by the Latest Views Widget display for each visit. This may seem redundant but it allow you to drill down for each individual visit the visitor made allowing you to see their use of the site over time. OWA captures a lot of data and the Dashboard is intelligently designed to allow the site owner to gather important data quickly and to drill down for even more specific data. Next time we will look into the Page Detail portion of Open Web Analytics which includes Prior and Next pages viewed, Heatmaps, Domstreams and Dom Clicks. Let me start off by saying I am not a huge fan of Google Analytics, never have been. Why? Well it has always seemed clunky to me. I don't if it's the layout, the presentation of data or something else. Even though I am no fan, Google Analytics provides great data expecially considering it is free. It's the defacto standard in Analytics, and it seems that everyone uses it, myself included. I heard about Open Web Analytics a while back and yesterday I stole some time and got it installed and started tracking our main site to see what kind of data it provides. Well I must say that I am sorry I waited so long to get it installed. I am so impressed with Open Web Analytics, just on the dashboard I find I can get a lot of useful information without having to do a lot of digging. Getting OWA up and running was a simple matter. Setup a subdomain, create an apahe config file, upload the source, modify the directory and file permissions, setup a database and user (I used phpmyadmin) and go through the OWA setup. Now I ran into a problem with the automated setup so I had to manually create the owa-config file and modify the DB information but it was pretty straight forward. I know it sounds like a lot but it really is quite simple and well documented. I think the whole process took about 10-15 mins to complete and that includes trying to figure out what went wrong when the auto-setup failed. 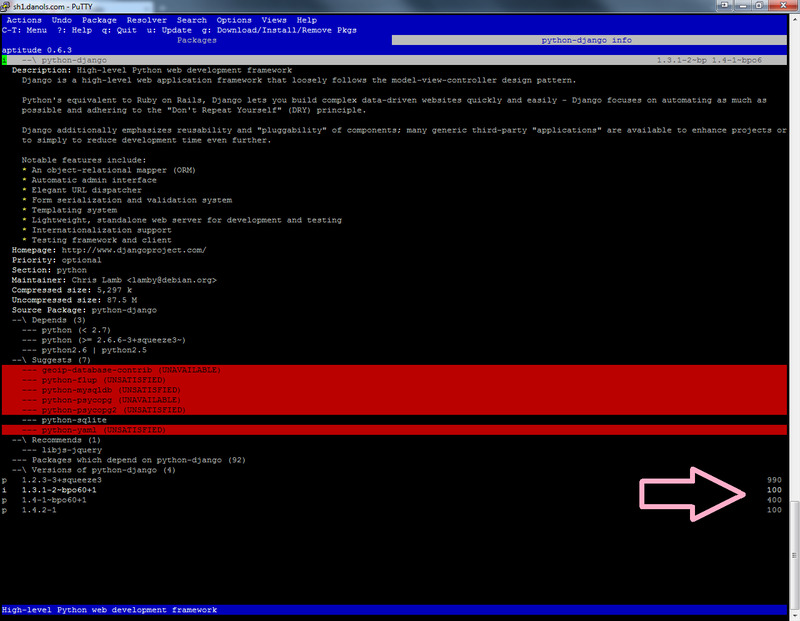 All said and done, with the documentation if you know how to FTP you can get OWA setup and running. I decided on a sub-domain but there are other options available. With the site setup it was time to visit the page to create some data. I should mention that you can exclude IP address from tracking but I wanted to see data now so I skipped that step for now. Even with only 1 visit what I saw impressed me very much, it looks very similar to GA but there is much more information presented initially. The Dashboard is what makes this software for me. From this page I can get quick information about a lot of useful information. The way in which the data is organized is very clean and allows me to gather an excellent snapshot of visits to the site. 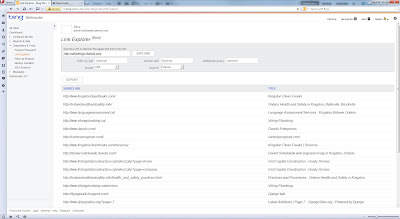 Here is a quick chart compairing the dashboards available in Open Web Analytics and Google Analytics. This data reflects what information is available on the Dashboard without having to click through to any other page. Here are some screen shots of the two platforms. Stay tuned as I will be covering more of OWA and GA. 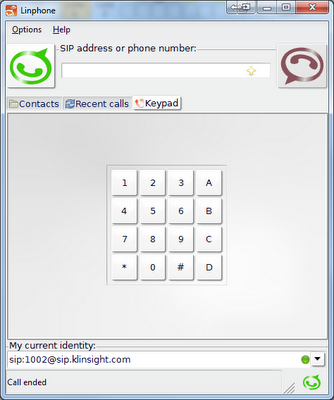 This fantastic multiple SIP line, multiple platform VOIP soft phone was working great until a week ago where all my incoming calls would terminate after 37 seconds on the dot. Logs were not tell me much. The only indication that was different I could notice was the status icon in the 'My Current Identity' section. Upon lengthly process of elimination I narrowed it down to an issue with using the UDP as protocol transport for the VOIP calls. Switching it to TCP fixed all my dropped call issues and furthermore the presence status icon is correct; go into your Options > Network Settings > Network Protocols and Ports and switch it to TCP. I hope this saves someone the same frustration I had as overall this is a great free piece of software. We are aware of the network issues with our hosts and are working for a full resolution. When copying or pasting content Windows attempts to preserve formating between applications. In my line of work this is mostly a hindrance and requires an intermediate Notepad copy and paste step. However there is hope! and it comes in the form of a small utility named Pure Text. I suggest you place this tiny 28KB program into your Startup folder or on your desktop. Once running you can access its settings through the task tray icon. In the program's options you can specify a new Windows system wide keyboard shortcut for plain text paste; 'Win' + 'V' seem like a good choice. For quite a while I had broken rendering in putty when accessing our Linux servers. Searching the net resulted in solutions most stating to use UTF-8 encoding setting in Putty. This however was only partially successful as line rendering was still broken. 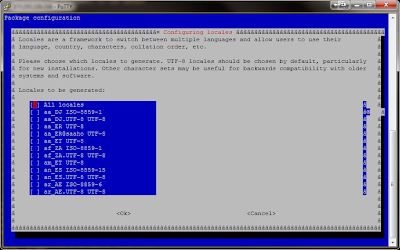 Running 'dpkg-reconfigure lecales' again shows that rendering is now correct. The FBI seems to be concerned about the DNSChanger Malware that is infecting machines around the world. You might want to visit the site http://www.dcwg.org/ prior to July 9th and test your system or you might lose your internet connectivity. This site has a lot of information about this malware and also provides links to test your system and if infected directs you on how to remove the malware. 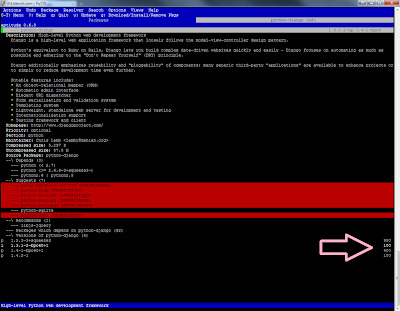 The FBI also has a site http://www.fbi.gov/news/stories/2011/november/malware_110911 that discusses DNSChanger. I would say this is a legitimate concern. I have only tested my machine so far and it tested clean. While on the topic of virus / malware attacks, have you given thought to a disaster recovery plan? First step is prevention, with trusted antivirus software. Even more important is a tested backup / recovery plan. And the final step is a plan that you would follow in the event of physical disaster, whether it be an office fire, theft of systems, or hardware failure. Don't learn the hard way! Give disaster planning some thought, and if you need any help with this please contact us to assist you. You will see that in this article (http://news.cnet.com/8301-1009_3-57439407-83/google-will-alert-users-to-dnschanger-malware-infection/) Google will be warning people that their computer is infected. 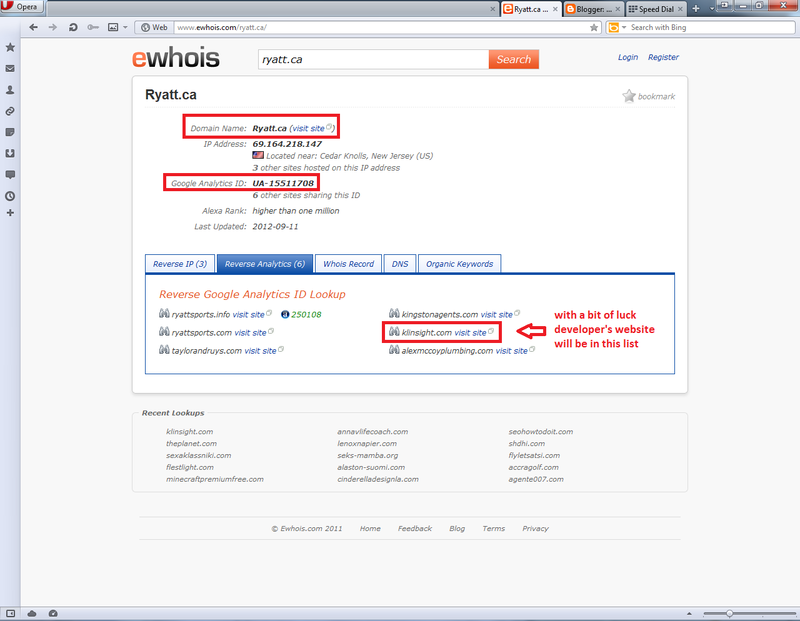 If you get a notice (see below) on your browser when searching then you will need to follow the directions for removal. Apache Multi-Processing Modules (MPM) prefork is the original like apache 1.3 implementation which is used where multi-threading could cause issues i.e. PHP hosting. The worker MPM is a multi-threaded and claims to provide higher performance and lower memory footprint than prefork. From this semi scientific test it is clearly worthwhile using apache2-mpm-worker on a server that is purely serving and hosting django projects. Recently Microsoft has updated their SkyDrive cloud storage solution, however with this update they also reduced storage to 7 GB. Existing SkyDrive can upgrade 'back' to their 25 GB free storage by visiting their account manage page. Please note you must have used the service before this upgrade to qualify, see this page for more details. It is worth pointing out that even the reduced 7 GB beats Google Drive and Apple iCloud by 2 GB and DropBox by 5 GB. More information can be found on the official SkyDrive compare page. Further more one can upgrade up to 100 GB of storage $50.00/year making it a feasible cheaper alternative to cloud backup/archive offered by S3 Amazon Storage. This task can be accomplished by setting up FUSE (Filesystem in Userspace) which is a post for another day.